Maximatecc (Sweden) presented the CCpilot VC display product platform at the Conexpo 2014. 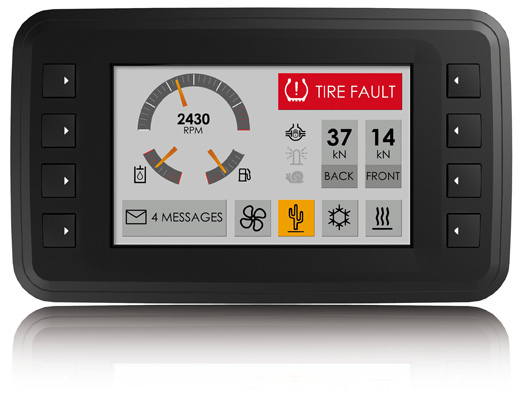 This display makes it possible to offer operator support functions for example in agriculture vehicle applications. USERS OF INDUSTRIAL VEHICLES are increasingly expecting the same user experience from their work equipment that they get with their smartphone or in their car. The Maximatecc response to this trend is to adapt the technologies from the smartphone and automotive markets in a product packaging for the industrial vehicle domain. Like it has been the case in the automotive industry, we can predict that most of the innovations for the industrial vehicle market will come in the domain of software, through soft products and apps that help improve the user experience, human-machine interaction, equipment utilization and life cycle profit. For advanced industrial machinery, this is already the case, illustrated by the developments in e.g. advanced forestry machines, tractors and mining equipment. What will follow is the same development in less advanced/costly equipment, requiring a product packaging suitable for those markets. The CCpilot VC is based on an ARM Cortex A8 core with Linux operating system. You can choose to run applications on the Linux system or utilize the Linx software suite, an open software application platform where applications are developed in Qt and/or Codesys. The software suite features a range of ready-made software components, meaning that sharp user interfaces can be realized with very limited expenses for programming resources. The company offers software development services that can be deployed either on advisory basis or for development of a complete system. The product features two CAN interfaces, supporting either CANopen or J1939. Besides managing information from two separate CAN networks, the unit can also be used as a gateway between these networks. Other serial interfaces are Ethernet and USB, used for software load, peripherals etc. The analog video input (PAL/NTSC) makes it possible to use the device as a video monitor. With its 5-inch TFT display with WVGA form factor and resolution, the device offers high readability and enables design of sharp and user friendly GUIs. The standard version uses eight configurable push buttons for user interaction. The touch screen is optional and there is also the option to have both push buttons and touch screen. The enclosure is designed for flush mounting in a panel/dashboard/armrest but it can also be fitted to a bracket.